Bowl For Kids’ Sake is one of Big Brothers Big Sisters of Tampa Bay’s largest annual fundraisers, generating over $200,000 annually to support their mentoring programs that empower the potential in thousands of kids across the Tampa Bay area. Revenue generated from Bowl For Kids’ Sake allows the agency to pair more at-risk children (called “Littles”) with adult volunteer mentors (or “Bigs”) and create a positive impact through professionally-supported relationships that will last a lifetime. Participants in the fundraiser recruit a team of people to help collect donations and fundraise for BBBS of Tampa Bay, then celebrate their hard work fundraising with a bowling party! Each year, the top fundraisers for Bowl For Kids’ Sake are invited to a special VIP bowling event, hosted by the Tampa Bay Rays, in appreciation to those who have worked hard to support the agency and its programs. The VIP event features bowling, pizza, raffle prizes, a silent auction, goodie bags, t-shirts, an autographed baseball for the lane captains, Raymond, the Rays’ Street Team and the chance to meet a Tampa Bay Rays player! 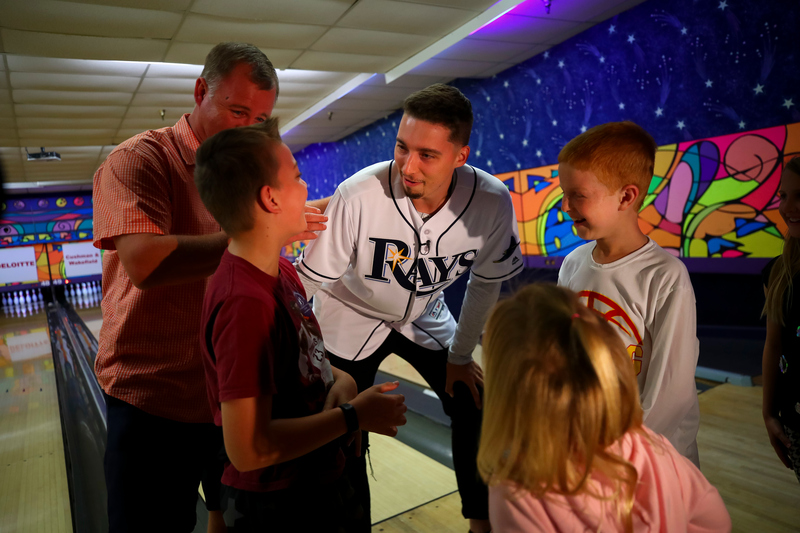 This year, bowlers had the chance to spend time with Rays pitcher Blake Snell, the reigning American League Cy Young winner. After an introduction by Stephen Koch, President & CEO of BBBS of Tampa Bay, Snell met with bowlers, signed autographs, posed for pictures and especially enjoyed interacting with the kids. He stopped to bowl a frame and, of course, bowled a strike! Snell was excited to support BBBS of Tampa Bay and enjoyed chatting with Littles who were attending the event with their Bigs. You can support BBBS Tampa Bay by donating to the Tampa Bay Rays Bowl For Kids’ Sake fundraising page here. View the full photo album from the event here.